If you want one of the most beautiful sounds of the Islands you will choose “Blue” for your event. The harp is designed for concert performances with every string having a microphone pick-up (44 separate microphones). The pedals give her a full range of chords and a complete repertoire of songs including jazz, rock, and blues that are not available on a lever harp. Amplification is important for larger groups and outdoor settings where wind can diminish an instrument’s volume. 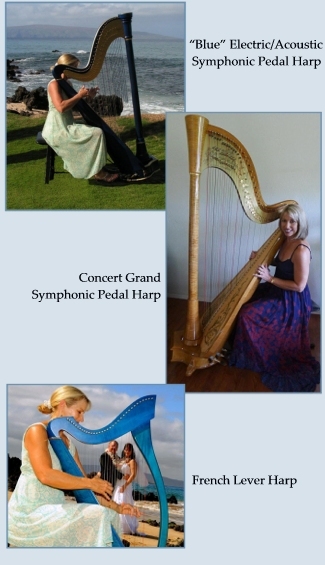 The Concert Grand harp is designed for the dynamics of a symphony and is the largest harp made, weighing over 90 pounds. This harp carries the fullest sound and richest tones. As with my other pedal harp, the foot pedals allow an almost unlimited repertoire and also produce the glissando, one of the beautiful sounds the harp is known for. This harp is also electric / acoustic with 47 microphone pick-ups, making it perfect for conventions and large receptions. Due to its size, not all locations are possible. If you are one of those adventurous people that want an intimate wedding on the beach, this is the harp for you. The lever harp is similar in tone to a Celtic harp and being two-thirds the size of a pedal harp and one-third the weight, it is easily transportable, making it a wonderful choice for smaller events.